Le Kiosque d’Orphée was a French record company launched by Guy Batard in the late 1950s. At first a mere pressing plant printing covers on demand, it became a proper folk music label during the 1970s. They released a wide range of music genres, from pop songs to folk and traditional music, from Masonic music to regular stage music (see discography here). 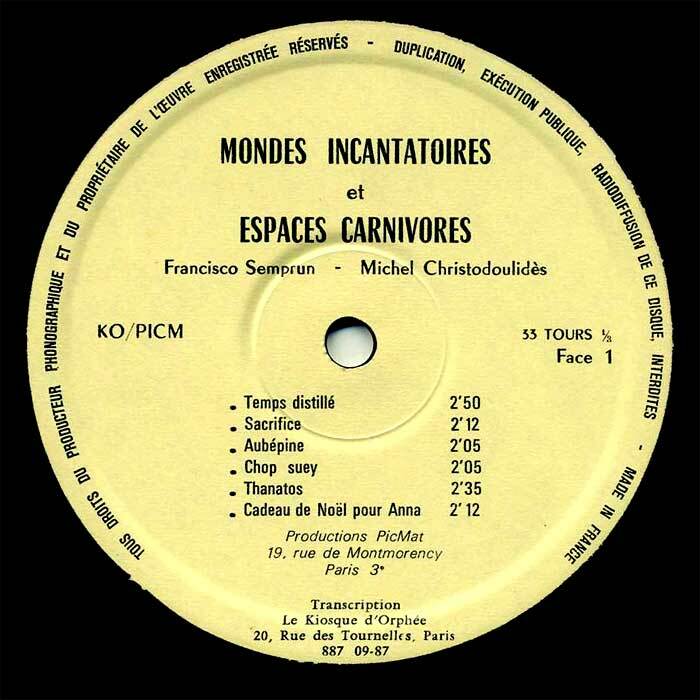 They also produced artist-funded, private releases of small run discs (sometimes as few as 50 copies), and Mondes Incantatoires et Espaces Carnivores (Incantatory Worlds and Carnivorous Spaces) is one of them. Spanish-born Francisco Semprun and Greek-born Michel Christodoulidès are both Parisian, incidental and stage music composers, working on their own or as a team during the 1970s. They mostly composed for film soundtracks and theater, including several Ionesco plays (see list below), as well as music for dance and mime theater, or physical exercise known in France as ‘expression corporelle’, with several LP releases during the 1970s (Choréo-Rythmes, Espaces Dynamiques and Métamorphoses) on the French Unidisc label. 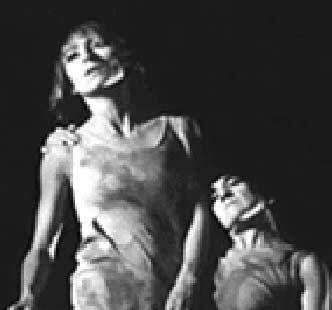 As a daily job, they improvised during dance and theater workshops. 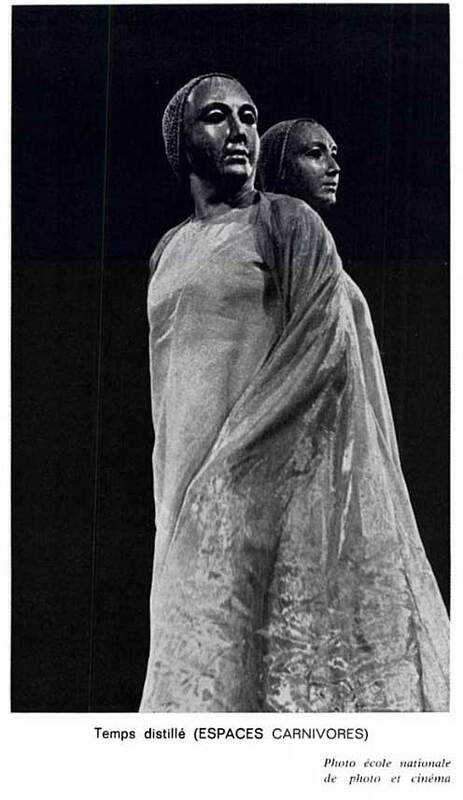 This disc compiles various tracks composed by Semprun and Christodoulidès for clown and mime plays by two French women named Pinok et Matho, real name Monique Bertrand and Mathilde Dumont. 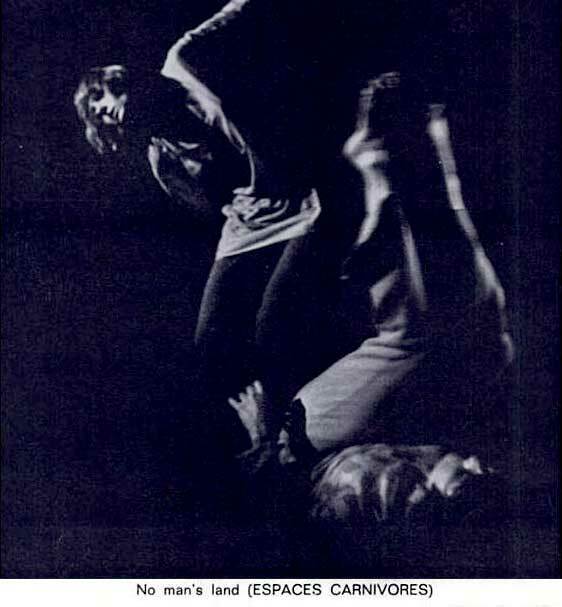 They created their pioneering Paris corporeal mime school called TEMP (Théatre Ecole Mouvement et Pensée) in 1962, where many French actors attended workshops in the 1960s and 70s. They wrote several books that were widely used in France by school teachers. The b&w photos below come from their 1976 book ‘Dynamique de la création : le mot et l’expression corporelle’, published by Librairie Vrin. The book mentions several mimes they created along the years like Le Sacrifice, Cadeau de Noël pour Anna, F1 F2 HLM, with soundtracks included on this disc, while pictures illustrate their 1970 Espaces Carnivores series, including Temps Distillé and other mimes (date from Métamorphoses LP back cover). Pinok et Matho’s style apparently encompasses clown, theater, gymnastics and mime, and they say some of their gestures were close to that of insects (‘proches des mouvements de certains insectes’). 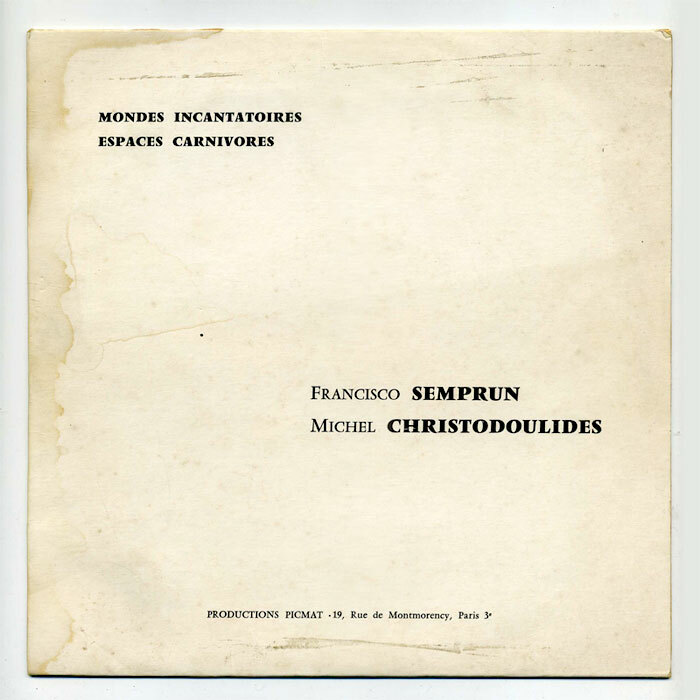 Semprun and Christodoulidès later Espaces Dynamiques and Métamorphoses LPs on Unidisc were also composed for the Pinok et Matho duo. I posted a 1962 Lasry-Baschet 7” single from Unidisc before. Semprun and Christodoulidès play acoustic instruments in a reverberant acoustic space, reminding a stage, as opposed to a studio facility. They use a variety of percussion sounds from darbuka, xylophone, marimbas and plucked guitar sounds, the latter reminiscent of Giacinto Scelci’s Ko-Tha/Three Dances of Shiva for guitar, 1967 (esp. on #5 Thanatos). Elsewhere, the pseudo-primitive rhythms recall Harry Partch’s Ballad for Gymnasts, 1961, or Moondog’s first albums, like The Story of Moondog, 1957. The other instruments, mainly flute, zither and acoustic guitar, create timeless melodies evoking Ancient Greece or imaginary ethnic music, though playing technique is often unusual – like a solo flute based on overblown harmonics only or a guitar played with a glass stick. 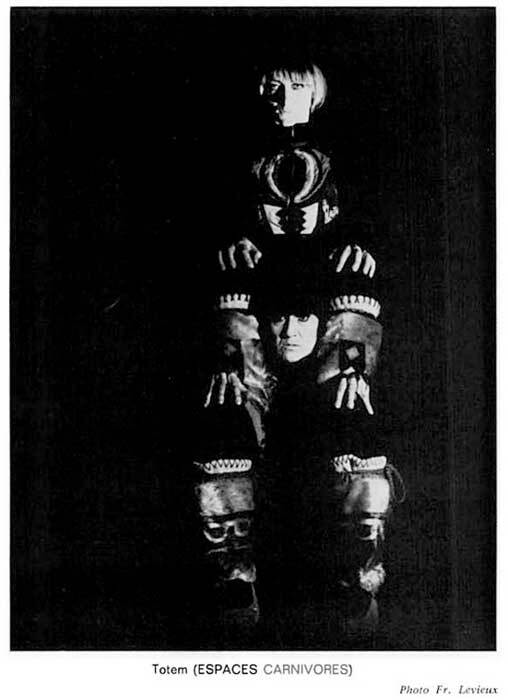 Occasionally (in the table top guitar playing of #11 Gravats, for instance), the music gets quite weird and ambiguous, in a way that would suit Henri Michaux’s film on LSD and mescalin effects, Images du Monde Visionnaire, 1964 (see Ubuweb). Note: record is dirty, so you’ll have to cope with a little sizzling.